Many who go to church on Sunday or synagogue on Saturday accept what is preached and don't question or discern whether or not what they heard was truth or error. Most of the time, we do it without thought, religiously. Most of us have been religiously taught from a tailored and highly misinterpreted set of "Scriptures," which are the basis and fundamentals of our faith. Often the words of Yah are taken out of context and misquoted. And, to add to the problem, we have become lazy and don't take the time to study and think about what He is really trying to say to us. With the introduction of front yard 10-Commandments displays came more confusion and misconceived ideas of what these ten Laws or Instruction really mean. We have been taught to view them from a Greco-Roman, Western mentality rather than the original Hebrew setting they were given in. What if the Scriptures actually came alive and were made exciting--like they were meant to be? What if we suddenly opened up to a deeper understanding so simple yet so incredible that we would want to follow the Bible for the rest of our lives and regret all of the time we've wasted not doing so? Moreover, what if we find out that we've been DECEIVED? There is only one approach that is true. That is--the way Yah intended from the beginning. In these latter days, He is opening the minds and hearts of people who want a faith that is passionate, a life that is worth iving, and a God they can trust and understand, who wants a real relationship with them. 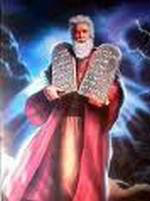 The Ten Commandments were given to such a people so that we could have that necessary relationip. These commandments will help us have this relationhip, when we understand them in their proper Biblical interpretation. Consider what Yah is doing right now, as it was written in the Scriptures for our time. Jeremiah 16:19 O Yah, my strength, and my fortress, and my refuge in the day of affliction, the Gentiles shall come unto You from the ends of the earth, and shall say, Surely our fathers have inherited lies, vanity, and things wherein there is no profit. If our fathers who have inherited lies passed these lies down to us, they may have done it in complete innocence and ignorance of the fact. Now is the time for us to awaken to the truth. When was the last time you opened up your Bible and read the 10 Commandments? Did you actually begin with the first commadment at Exodus 20:2? Here are the true "10 Words" or 10 Commandments that were given to Moshe/Moses at Mt. Sinai. See if these commandments sound like the ones you know, have seen or read in books.